'Something wicked this way comes' Returning home from battle, the victorious Macbeth meets three witches on the heath. Driven by their disturbing prophecies, he sets out on the path to murder. 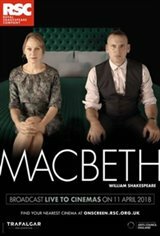 Our contemporary production of Shakespeare's darkest psychological thriller marks both Christopher Eccleston's RSC debut and the return of Niamh Cusack to the Company.